The world’s only self-therapy device that reduces arm pump used by the Fastest Riders in the US is now available for all the European Riders. Creating more freedom in the forearm compartments results in less Arm-Pump, more grip strength and endurance. It’s perfect solution for every Amateur or Professional Athletes who suffers from Arm-Pump. Physio or medical supports are no longer needed. 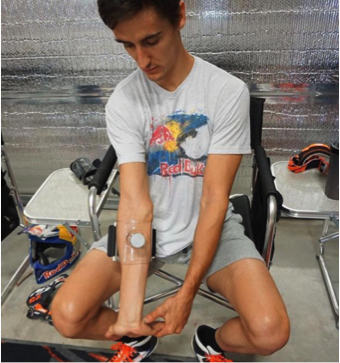 Ryan Dungey, Ken Roczen, Marvin Musquin and many other great Riders who tested the device cannot do without this invention to reduce hardening of the forearm and increase their resistance to vibration and shock anymore. Legendary motocross trainer, Aldon Baker believes this is one the greatest benefits of 4Arm Strong. “The value of reducing arm pump speaks for itself, the value of increasing grip strength without resistance training is monumental!”. Aldon began using the 4Arm Strong with his riders who quickly claimed it was making a positive impact on their riding. 4Arm Strong creates traction on the forearm muscles toward the elbow while stretching in the opposite direction. This type of assisted stretch can expand the fascia and lengthen the forearm flexor muscles in the anterior and posterior compartments of the forearm, as well as create a stretch in front of the elbow that otherwise couldn’t be achieved. Anterior describes the inside or bottom of the forearm and posterior describes the top of the forearm. Expanding the fascia and stretching the forearm flexor muscles can create more space in the forearm compartment, which allows blood to flow into the muscles with less constriction. Less constriction translates into less arm pump. It also results in a freer, less restrictive movement, which almost always results in greater grip strength. For more information about 4Arm Strong, visit 4armstrong.eu or contact us at info@sevengmbh.com.